A few weeks ago, we joined 66,000 collectors, new buyers, connoisseurs and art enthusiasts from around the world at the 64th edition of BRAFA in Brussels to see fine art, antiques, modern and contemporary art and design displayed by exhibitors across some 165,000 square feet of exhibition space. We got one of our best marketing takeaways not at the actual event but at our hotel. We noticed a well-placed stack of publications from BRAFA in the lobby of our hotel during check-in. The pub was 40-pages, full color, printed on high-quality stock and perfect-bound. We found this “City Guide” as it was called to be very helpful. It included practical info for the show including location, times, transportation options, etc. It also included a list of restaurants and wine & cocktail bars with addresses, telephone numbers, open/closed days and websites. Plus there were additional lists of museums, performing arts and shopping areas. The content wrapped up with a piece entitled “Favorite cultural spots in Brussels”. Lots of great stuff for visitors. The City Guide had clear and prominent BRAFA messaging on the front cover, which included the show name and the descriptor “Art Fair”, as well as the dates in big white type and location so anyone that looked at this pub would know that BRAFA was an event happening during their visit. This pub was a great way to introduce BRAFA to hotel guests who may not have known the event was going on while they were in town. It offered value to people who were already planning to attend the event as well. This marketing program also delivered exposure for BRAFA’s principal sponsor which received front cover branding and a full page ad. There were several pages of ads for other companies too. Offering valuable content like this increases the shelf life of the marketing vehicle vs. a run of the mill promotional piece. We kept the piece throughout our stay which provided more exposure for the show and principal sponsor. We have worked with exhibition and event clients on a wide range of initiatives targeting tourists and business travelers in the market during show days. 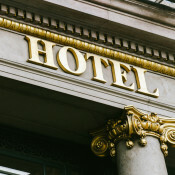 There are numerous ways to target this audience but the hotel channel is one we always consider. ENCORE CLIENTS: Interested in learning more? Please contact us for several other interesting details we noted regarding the execution of this BRAFA marketing program.